I got a big smile on my face looking at this picture, Carin. I LOVE the spin on the first day, first meal of the new year. Those little touches of golden yellow against the dark table, and wherever did you get those wonderful place mats? Thanks, Allison. I think the mats may have come from Florida. We once had family there. Love the natural history and am wild about the Everglades. My first thought was… beer? In the morning? What isn’t Carin telling me? Then the rest of picture came into focus. Champers with pineapple juice! Or vice versa. And yum it was. This shot is me waiting for the eggs bennie to arrive. What a refreshing New Years morning shot! The liquid sunshine bodes well for a lovely year. And I love the pineapple mats. Perfect! Happy New Year, Carin. And the same to you, Maureen..! Such a delightful, refreshing shot, Carin. 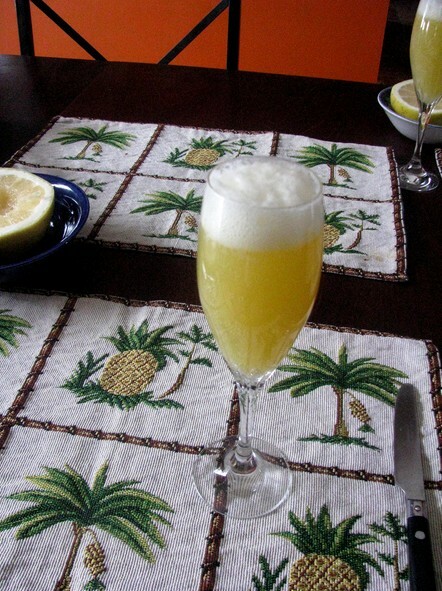 Love the insouciance of the pineapple place mats, the froth on the juice. This photo does give the impression one is waiting for something — and eggs bennie is worth the wait. Especially homemade.